Jatiluwih is an agricultural village that produce rice in a large quantity in Tabanan. The village is located in the middle latitudes with moderate humidity. Jatiluwih area is well known as a tourist attraction very wide terraced rice fields. Most of the region is Jatiluwih rice paddies commodities. 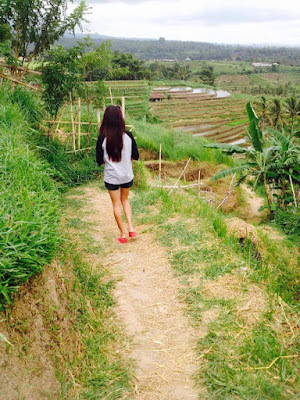 Jatiluwih village is a picture of the real Bali. The village is still very beautiful. Some people in the village still use traditional ways to work their fields. In fact, many are still living in a very traditional life, ranging from the cooking process to build a house. But the traditional life by the community in Jatiluwih very rarely known by outsiders. Because their lives are very far away from the eye. Jatiluwih very famous rice terraces are very broad. In this village still retains an ancient organization in terms of irrigation. Subak Jatiluwih very well-organized. So that farm life by the people in this village are very good. All the rice gets a fair share, so that the water as the most important part of the farm can be managed well by the organization Subak. With terraced rice fields in Jatiluwih Subak therein organization has received recognition by UNESCO as a world cultural heritage that should be protected. Rice fields in Jatiluwih now a living museum, so it can be maintained and the preservation of its existence. As it gets protection and protection from the government in order not to disappear by changing times and people's lifestyles. Since recognized by UNESCO as a world cultural heritage, Jatiluwih is now the most sought-after tourist attraction in Bali. Travelers who come to Bali will make themselves available to see views of terraced rice fields in Jatiluwih. When the rice planting season, rice fields in Jatiluwih will look green. Green scenery in this village can be soothing eye and create a feeling of being very quiet. Terraced rice paddies in Bali is very typical. Because of the soil conditions in Bali uneven, also in Jatiluwih, so farmers had the idea to make a rice field in uneven ground. Farmers make terraced rice to be planted rice. Terraced rice paddies also give more benefits to the water distribution process. So the water can be shared with good and fair set and controlled by the organization Subak.